I was recently reminded of Biosphere 2, the failed wacky environmental experiment in Arizona in the early 90s and I immediately remembered Steve Bannon's connection to the project. So I went searching on Google and it's a great look at this scummy operator. Bannon seems to have faded for now, but he's a powerful and dangerous presence nevertheless because of his strong relationship with Robert Mercer. 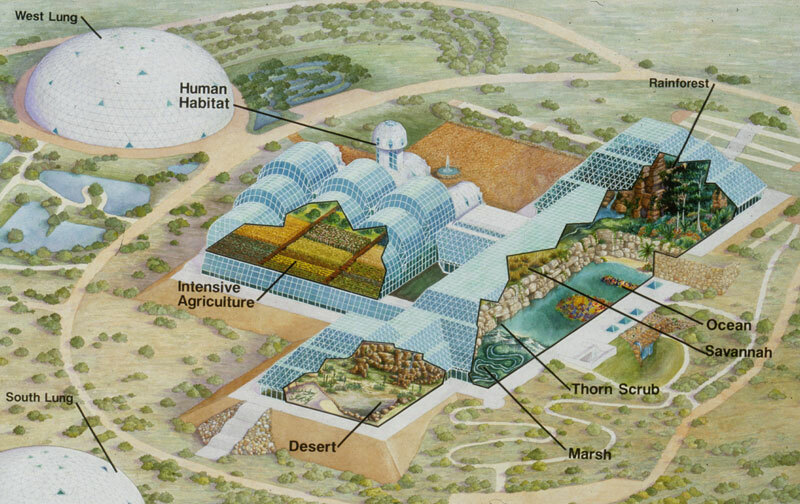 In the early 1990s, the Biosphere 2 experiment started, dreamed up by some rich hippie philanthropists and environmental scientists of a sort. At great expense plants and animals from many different ecosystems were brought to fill the covered 1.27 hectar space where many monitors had been placed to measure the relationship between the different conditions. The reasoning was that this setup would somehow replicate the global situation on Earth and allow us to understand how it functions. But the fact that the money behind the project came from an oil tycoon's fortune doomed the bizarre project from the start. The money people expected some results that would be leveraged for profits, like some sort of eco-moon shot, and when progress proved slow with three researchers shut inside the complex, Steve Bannon in his younger but no less ruthless guise, was called in to set things straight. Together with Star Wars and Logan's Run, the sequence reminds me of both Antonioni's Zabriskie Point, a film I blogged about on Steemit before, and also Silent Running with Bruce Dern. Dern plays an astronaut on a ship similar to what we find in 2001: A Space Odyssey flying to Saturn with 4 giant geodesic domes housing huge forest biospheres. He goes rogue when he learns of plans to jettison the domes and takes over the ship, left all alone with only the company of stumpy little shuffling robots to keep him from going nuts, and this is Bruce Dern so you know it doesnt work. Its a parable of an eco warrior and our fragility in space which also has an incredible timewarp look of early 1970s science fiction. And the whole Biosphere 2 project really needs to be made into a film now, the whole retro early-90s nostalgia of it is a powerful aspect of the whole story of our human folly, with characters like Steve Bannon ready to play super villains for real for the glory of their own demented power fantasies. Will we lose out in the end to the Steve Bannons of the world? With so many powerful people pushing us to the brink of extinction, I'd say the chances are pretty high it won't end well. This post has received a 0.45 % upvote from @speedvoter thanks to: @suffragator.